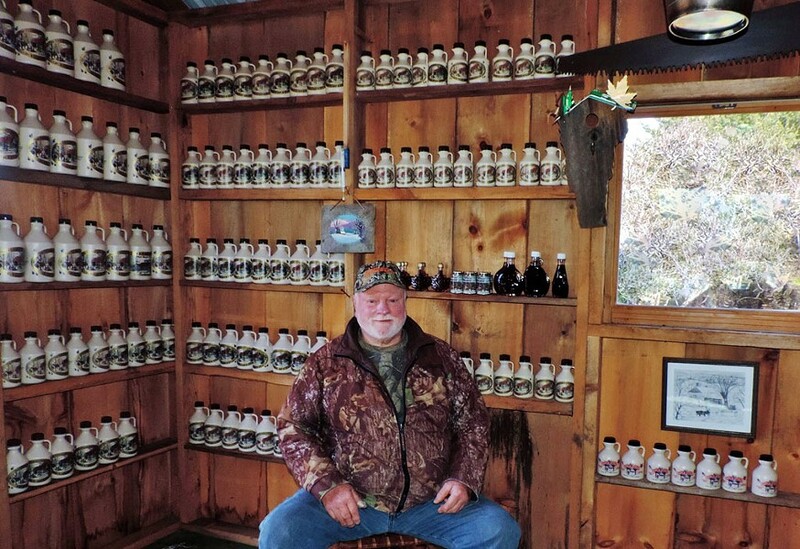 As Vermont's maple syrup producers opened their sugarhouses to the public last weekend, Fred's Shed stayed shut. The owner, Fred Hopkins, didn't have anything to boil. The week before, a vandal had stolen 100 of Hopkins' sap buckets right from the taps along Maquam Shore Road in St. Albans. The bucketeer dumped the frozen sap on the ground, leaving Hopkins confounded but resolved. He installed security lights and cameras, but the surveillance apparatus captured only the police who came out a few days after the initial theft to investigate the disappearance of 40 more galvanized metal buckets. They're worth about $5 each. Sugarmaking is Hopkins' hobby, not his livelihood. A decade ago, he built Fred's Shed, where he and his wife, Maureen, boil the sap and pencil each year's yield on the wall. One tree he taps produces sap with a 7.3 percent sugar content — nearly four times the average tree. "It's just like drinking sugar water," Hopkins said. In 2018, Hopkins produced about 40 gallons of syrup. He said he gives away a lot of it to neighbors and friends. The rest he sells at the Onion River Cobbler in Winooski, which Hopkins took over after his brother, Steven, died. A more entrepreneurial crook might have waited to steal the sweet stuff, Hopkins said. He valued the whole crop of high-quality syrup at "several thousand dollars." The peculiar nature of the theft brought plenty of media attention over the past week. It also spurred an Enosburgh couple to lend — and help install — about 45 sap-catchers on Hopkins' maple trees. Fred's Shed will reopen next sugaring season — as long as the new pails stay put. Referring to the thief or thieves, Hopkins said, "I really don't think they will come back a third time."